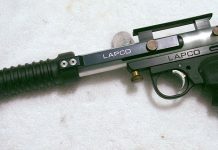 A look a one of Colin Thompson's Lapco Force Recon pump paintball markers from the early 1990s. 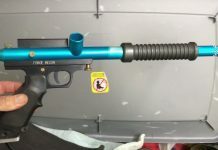 This pump is breech drop and electric sky blue. 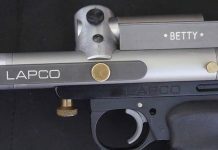 A closer look at Rick "Relliot" Elliott's Lapco Stock Class Ghost, Betty, engraved with number 25. 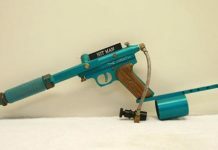 Likely made from 93-94 in San Diego.